One aspect of Twitter that often gets overlooked is Lists, which is a curated group of Twitter users organized into lists based on interests. Lists can consist of customers, competitors, industry influencers, news sources, people you have interacted with, friends, hashtag users, and others. Making lists helps you filter out the otherwise noisy Twitter timeline and target interactions with people who truly matter to your business. They are also a good way to keep an eye on what your customers and competitors are talking about at any given moment. In those cases, you can set up private lists that are available for your eyes only. Here are some general guidelines regarding the use of lists. You do not have to follow a user in order to add him or her to a list. You can have both public and private lists. You can subscribe to lists created by other people, and others can subscribe to public lists you create. Viewing a list timeline will show you a stream of tweets from only the users on that list. Twitter will show you any list you are a member of. Lists are for reading only. You cannot send a Tweet to the entire list. You can link to any list by mentioning it as you would any Twitter user. 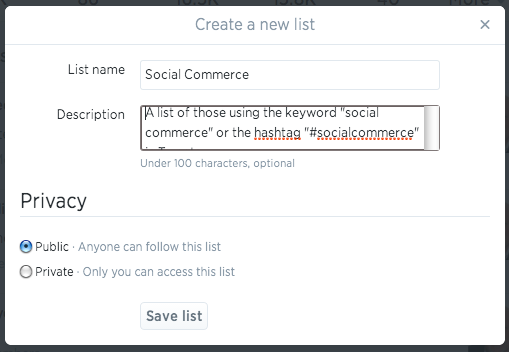 Add a forward slash (“/”) followed by the list name to list owner’s username: @[username]/[list-name] (example: @pchaney/socialcommerce). Follow these steps to set up a Twitter list. 1. Go to the Lists page either by clicking the gear icon drop-down menu located in the upper right-hand navigation bar or by going to your profile page and clicking the “More” drop-down menu and select Lists. Click the gear drop-down menu item and select Lists. 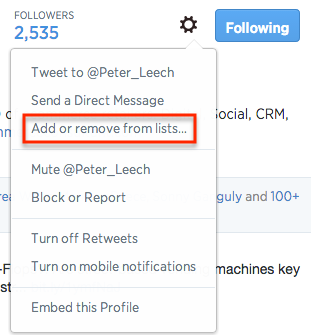 Another way to create a list is by clicking the “More” menu item on your Twitter profile. Click the “Create new list” button to set up a list. 3. Enter a name for the list along with a short description, and choose whether you want the list to be public or private. 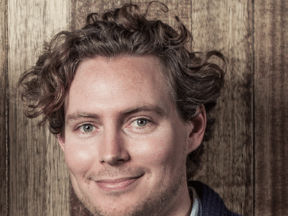 List names cannot exceed 25 characters. Add a name and description, and then make it public or private. To add or remove people from your lists, follow these steps. 1. Click the gear icon drop-down menu on a user’s profile. Add or remove people from your lists. 2. Select “Add or remove from lists.” A pop-up will appear displaying your created lists. 3. Check the lists you would like to add the user to, or uncheck the lists from which you would like the user removed. Once added, the person will appear among the list of members. You can also search for people to add to your list. Search for people to add to your lists. 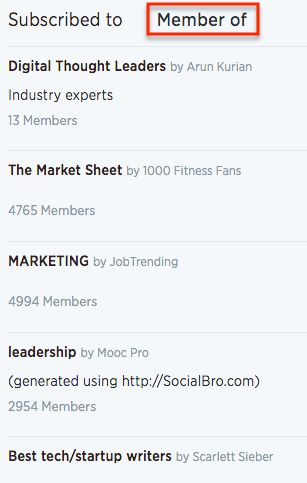 To see lists that you are on, click on “Member of” on the Lists page to see lists that include your username. See what lists on which you are included. To view Tweets from a list, follow these steps. 2. Click on the Lists tab located under the “More” drop-down menu item. 3. Click on the list you’d like to view. An example of a Twitter list timeline. 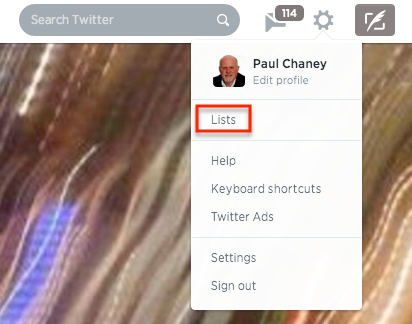 More information about using lists is available on the Twitter support site. Here are three tools to help you manage lists. 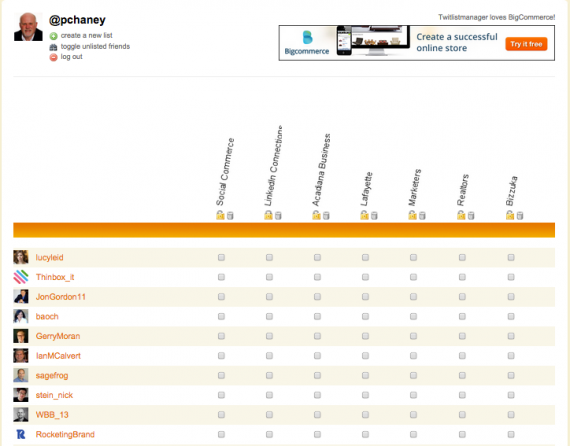 TwitterListManager.TwitListManager is a utility that offers a comprehensive way to manage your Twitter lists. It pulls together the people you follow, as well as any lists you’ve already created, and puts everything on a single page. You can create new lists, or check boxes to add or remove people to your lists. List Builder for Twitter. 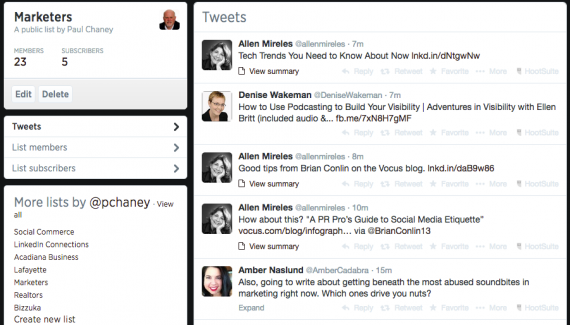 Google Chrome users can add an extension that lets you build Twitter lists quickly. Visible from any timeline view, you can select individual tweets or all on the screen and include the users into a list. Quickly create lists using the Google Chrome list builder tool. TweetBe.at. TweetBe is a free app that connects to your Twitter account. It shows a list of your Twitter followers and gives you the option to add or remove followers from a list, or create new lists. A filtering tool refines search capabilities so that you can find relevant followers more quickly. A Chrome extension is also available. TweetBe has filters to make it easy to find relevant users.